The first thing I noticed about the museum was the amount of bright, colorful art. The walls were covered with Vi&apos;s work and it was all very interesting to see how the fossils were used in each piece. At one time the fossils in that area must have been very abundant for them to collect so many and use them for the folk art. I thought some of the flower arrangements with oil backgrounds were particularly pretty. Vi Fick incorporated shark&apos;s vertebrae in paper mache to make the vases; fossilized fish bones were used for stems; and fish vertebrae, oyster shells and crystalized disks made up the flowers. 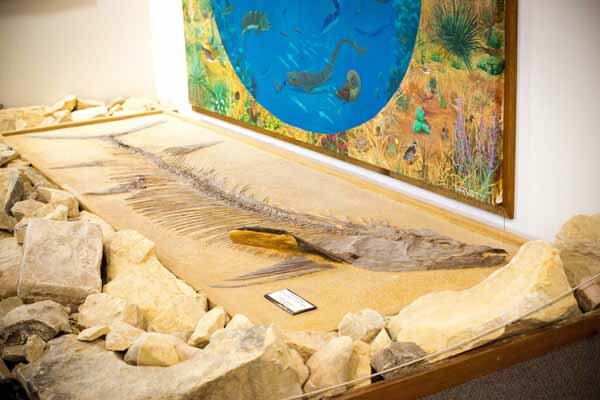 This is the second museum I&apos;ve been to in this area that displays remnants of western Kansas prehistoric creatures. This time we enjoyed seeing a rare Plesiousaur paddle, a 15 foot Xiphactinus Audax and Mammoth fossils, among many other artifacts. Besides the over 10,000 shark teeth and many other fossils, the museum also displays a real sod house and a replica of a creamery and telegraph and cable house. There were many other items that I enjoyed seeing displayed such as the old fabrics or the kitchen items that I generally look for when I vintage shop. When touring the museum, you can also get a feel for the town&apos;s connection and love of Annie Oakley (no relation to the town of Oakley&apos;s name) and Buffalo Bill. There are life size cutouts of the two which are fun for young and old! Depending on the direction you take into Oakley, if you are on US 83 just outside of town, you can&apos;t miss the enormous bronze statue of Buffalo Bill chasing a buffalo. In the Fick Fossil Museum you can find a smaller version of this statue. We left with some cute pictures of the kids behind the cutouts and my husband continues to talk about the story of the German family massacre that was described in one of the displays. If you too would like to take in some Kansas history, stop by the museum. Admission is free and donations are welcome.